Some personnel were busy dismantling the erected scaffold in an excavation area when an operator of a dump truck suddenly park the equipment too close in the vicinity. The scaffold chargehand gave an instruction to the operator that he have to move his equipment away from the working area to protect it from falling materials. The operator started his engine right away and directly reversed it without checking the surrounding area. 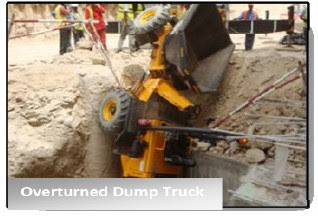 The dump truck hit the barricade protection around an excavation, breaking through and overturning into the excavation. Luckily, the operator escaped from injury but some damage was found on the rear of the dump truck. The operator was not thinking and paying attention. Human Factor - Attitude of Operator. Training session to all operators. Vehicle inspection to ensure no failure of equipment as contribution to incident. Concrete ballards should be installed as barricading around excavation. "This type of vehicle equipment should not be permitted to drive too close to any excavated area. A banksman must be appointed for traffic management system. The operator must be trained and qualified". I like the execution of some SevenFriday watches replica watches sale more than others. The minute hand begins with a large wheel with spokes style design and has a smaller hand jutting out of it. The hour hand, by comparison, is a bit hidden replica watches sale underneath. It is not difficult to read, but isn't a model of legibility. The dial, like the case, is full of whimsical design elements that play out as a sort of satire on industrial design. SevenFriday watches don't take themselves ultra seriously because they aren't trying to be tool watches. Rather, they are trying to be rolex replica uk interesting, gadgety fashion watches for men who don't use the term "fashion" in their vocabulary. With that said, not all of the text on the dial or the indicators on the rear of the watch make sense–nor do they rolex replica uk need to. The dial of the SevenFriday P watches has some intentionally superfluous text and it is easy to criticize elements on the rear of the case such as the picture of replica watches sale the Scuba diver indicating the water resistance rating.